0x010C triaged T212580: Avoid duplicate recording : compare list to speaker's previous records in target language so to hide words previously recorded as High priority. 0x010C added a comment to T208641: Improve categorisation for languages that do not have ISO 639-3 code. 0x010C added a comment to T212239: Warn users about the use of their records. @Kvardek_du: Tu m'as mal compris je crois, je ne parlais pas de l'ajouter dans les conditions générale mais à l'endroit de la flèche rouge sur la capture ci-dessous, à la fin de la seconde étape du RecordWizard. 0x010C added a comment to T212581: Use vector logo rather than raster logo. I just said above that it should be possible now to use a SVG (and the current image is the biggest PNG we can have as a logo). This was historically impossible on MediaWiki, but since REL1_31 it should be now using $wgLogoHD (ref). 0x010C closed T212029: Improve the Lingua Libre bot to add links to files in Lexemes as Resolved. 0x010C closed T198014: Pb quand certains téléchargements ont échoué as Resolved. Hum, in fact, even if Lingua Libre Bot didn't add the audio recording to Wikidata and/or Wiktionaries, any contributor can add manually the audio recording to those projects as the file is stored on Wikimedia Commons. 0x010C merged T211086: Support multi-lingual wordlists in LinguaLibre Record Wizard into T196038: Allow the passing of custom properties and data into file's metadata. 0x010C merged task T211086: Support multi-lingual wordlists in LinguaLibre Record Wizard into T196038: Allow the passing of custom properties and data into file's metadata. 0x010C closed T212423: Find an other place to store speaker items id as Resolved. The RecordWizard-related user options will from now on be stored in a RecordWizard.json user subpage ([[Special:MyPage/RecordWizard.json]]). 0x010C added a comment to T212580: Avoid duplicate recording : compare list to speaker's previous records in target language so to hide words previously recorded. This could be a cool feature, but I fear all technical implementations will be ressource-expensive and time-consuming. So before choosing a solution, we should test its scalability. 0x010C updated the task description for T212580: Avoid duplicate recording : compare list to speaker's previous records in target language so to hide words previously recorded. 0x010C added a comment to T212583: Allow click-play-listen while recording in Record Wizard > Studio. 0x010C updated the task description for T212583: Allow click-play-listen while recording in Record Wizard > Studio. 0x010C moved T212239: Warn users about the use of their records from Organisation, docs, lists to RecordWizard on the Lingua Libre board. 0x010C closed T212028: Generate lists of words with Lexemes as Resolved. As @Lea_Lacroix_WMDE pointed out, this has been done during last week hackathon. See the new "External Tools" word list generator: https://lingualibre.fr/wiki/MediaWiki:Gadget-ExternalTools.js. 0x010C closed T196500: Allow batch downloading as Resolved. The creation of the daily datasets solve this request I think (https://lingualibre.fr/datasets/). @Unuaiga: Please reopen this task if not. 0x010C added a comment to T196759: Install some MediaWiki extensions. @Yug: This is unrelated to installing mediawiki extensions. MediaWiki (ans thus Lingua Libre) support the display of svg files, even if the upload of svg files is disabled locally. In fact, Lingua Libre is not meant to host files like images; for that, there is Wikimedia Commons. And after a quick search, your icon is already there: [[File:Font Awesome 5 solid microphone-alt.svg ]] (https://commons.wikimedia.org/wiki/File:Font_Awesome_5_solid_microphone-alt.svg). 0x010C updated subscribers of T196759: Install some MediaWiki extensions. @Yug: I've reverted your change, because SVG are natively supported by MediaWiki, no need of an additional extension. 0x010C updated the task description for T196759: Install some MediaWiki extensions. 0x010C created T212423: Find an other place to store speaker items id. 0x010C added a comment to T201135: Allow custom categories. Sure you can work on this, your help is really appreciated :). There is only one blocker, it is not easy yet to setup a development environment for Lingua Libre, but I'm currently on it, and it should be ready before Saturday. I don't know if you're aware of it, there is a LinguaLibre hackathon organised this week-end at Wikimedia France's office. If you want you can join us! 0x010C added a comment to T186739: Allow oauthclient-php to forge requests containing files. @Tgr thanks for the review and the merge! @Jnanaranjan_sahu The $this->config parameter send to makeCurlCall in 5th position on line 253 in the initial version was useless, this method was only taking 4 parameters. In fact, makeCurlCall can access by itself to $this->config because it shares the same instance of the Client class with makeOAuthCall (as you can see on the lines 276/279 of the initial version). 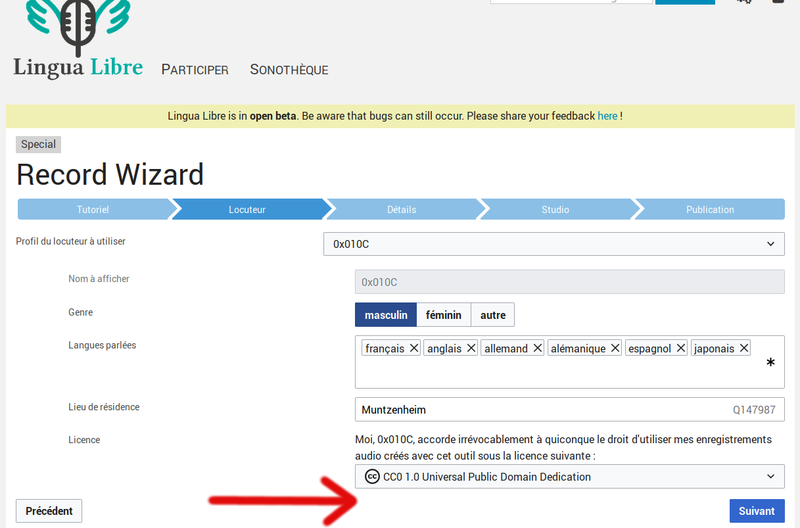 0x010C added a comment to T210477: RecordWizard does not work well the user interface in Occitan. I've already seen this issue in the past, but never figured out it's origin. A 500 is returned when switching the language interface to occitan (oc), but it works well with every other languages I've tested, so I'm a bit confused. I'll investigate this in more details during the comming weekend. 0x010C created T210124: Upload2Commons right managment is broken. 0x010C closed T209883: Upload of the RecordWizard is malfunctioning as Resolved. The Upload2Commons extension seems to be malfunctioning since the upgrade from REL1_30 to REL1_31. It defines two new user rights, "remoteupload" (to upload any files to commons) and "remoteuploadown" (to upload your own files to commons). By default, basic user only need the second to use the RecordWizard, only administrator had the first right. But since the upgrade, the extension asks for both rights to be set. 0x010C closed T209225: Record Wizard is broken as Resolved. 0x010C updated the task description for T208178: Include indication of the available shortcuts. 0x010C created T208178: Include indication of the available shortcuts. 0x010C closed T208165: Allow to delete recording on-the-fly as Resolved. Done in commit a0e71c4. Pressing the [del] key will reset the currently highlighted item. 0x010C added a comment to T208165: Allow to delete recording on-the-fly. Just to be clear, what you want is to delete the audio record attached to an item, but not the item itself, am I right? 0x010C closed T203345: Use 2 digit number for the month as Resolved. 0x010C created T203345: Use 2 digit number for the month. 0x010C created T201136: Sounds are crackeling during playback in the last step. 0x010C updated the task description for T201135: Allow custom categories. 0x010C created T201135: Allow custom categories. 0x010C added a comment to T197727: The date displays twice in the Recent Changes. 0x010C updated subscribers of T197079: Share/sync with Mozilla's "Common Voice" project?. 0x010C triaged T196852: Drop-down list behind window on Vector as Low priority. 0x010C closed T197599: Remove the small audio breakouts that happens sometimes as Resolved. In the LinguaRecorder library, when switching from the listening state to the recording state, we had to disconnect a first ScriptProcessorNode (see doc) and then connect the second one. If some audio sample arrived in-between, they got lost, creating the small audio breakout. To avoid this, I now use only one ScriptProcessorNode (which also simplifies other functions, because we no longer need to manage node disconnection / reconnection in many places). 0x010C added a comment to T195762: Review the design for reading elements the RecordWizard. 0x010C added a parent task for T195958: Review messages during the microphone activation step: T195947: Enhance the microphone calibration tool. 0x010C added a subtask for T195947: Enhance the microphone calibration tool: T195958: Review messages during the microphone activation step. 0x010C added a comment to T195947: Enhance the microphone calibration tool. I've made a first try by implementing somehow the second solution: A buton allowinf the user to record one word, which will be played one second later. Lets see how users will react. 0x010C created T197599: Remove the small audio breakouts that happens sometimes. 0x010C closed T196681: Create a link to user Commons upload on last 'Record Wizard' step as Resolved. 0x010C moved T196852: Drop-down list behind window on Vector from Backlog to UI on the Lingua Libre board. 0x010C added a member for Lingua Libre: Xenophon. 0x010C closed T196879: badfilename error when uploading recording of word “Kunstraum Kreuzberg/Bethanien” as Resolved. Yes it is the cause of the warning, the filename mentioned is a proposal from MediaWiki for a legal filename. 0x010C closed T196713: Import words from Wikipedia/Wiktionary categories as Resolved. Other wikis can now be supported (commit). I've added the Wiktionary, but other could be easily be added in the future. 0x010C triaged T196879: badfilename error when uploading recording of word “Kunstraum Kreuzberg/Bethanien” as High priority. 0x010C created T196879: badfilename error when uploading recording of word “Kunstraum Kreuzberg/Bethanien”. 0x010C closed T196834: Transcriptions are stored as English strings as Resolved. I finally changed the datatype, it should be better now. 0x010C triaged T196834: Transcriptions are stored as English strings as Normal priority. 0x010C added a comment to T196834: Transcriptions are stored as English strings. change the datatype of this property from monolingual text to simple string, as the language is already explicitly defined in an other property (this is the one I prefer, but need to edit manually the DB). 0x010C updated subscribers of T195762: Review the design for reading elements the RecordWizard. @LucasWerkmeister just pointed out on twitter that items sometimes jump from one line to the next/previous, due to the width difference of the to be read state (it has currently a small border that the other states doesn't have). 0x010C created T196759: Install some MediaWiki extensions. 0x010C added a comment to T196687: (Feature request) Create general worklists for Lingua Libre pronunciation. 0x010C added a comment to T196713: Import words from Wikipedia/Wiktionary categories. A first try has been made in this commit, but only one source is yet supported (Wikipedia currently). 0x010C created T196713: Import words from Wikipedia/Wiktionary categories. 0x010C moved T196687: (Feature request) Create general worklists for Lingua Libre pronunciation from Backlog to RecordWizard on the Lingua Libre board. 0x010C closed T195952: Add support to homograph words with distinct pronunciations as Resolved. A qualifier can now be appended to homograph words to precise their meaning, in the following format: "transcription (qualifier)"
If someone think this is not enough to manage every use-cases, just reopen this task. 0x010C added a comment to T195958: Review messages during the microphone activation step. 0x010C created T195958: Review messages during the microphone activation step. 0x010C created T195952: Add support to homograph words with distinct pronunciations. 0x010C removed a watcher for Cuddle: 0x010C. 0x010C removed a member for Cuddle: 0x010C. 0x010C created T195947: Enhance the microphone calibration tool. 0x010C awarded T195763: Make LinguaLibre wiki accessible on mobile a Cookie token. 0x010C updated the task description for T195762: Review the design for reading elements the RecordWizard. 0x010C added a comment to T195565: Create a new phabricator project for Lingua Libre. 0x010C awarded T195565: Create a new phabricator project for Lingua Libre a Yellow Medal token. 0x010C added members for Lingua Libre: Yug, Pamputt. 0x010C added a member for Lingua Libre: Remy_WMFr. 0x010C set the color for Lingua Libre to Green. 0x010C set the image for Lingua Libre to F18578031: profile. Using workboard columns will be easier for us I think (our sub-projects aren't big enough in my opinion). Huuuu (bis), I've completely forgotten this page... Lingua Libre is not ready (yet!) to welcome developers with little experience of MediaWiki, so I removed it from the page. 0x010C updated subscribers of T195565: Create a new phabricator project for Lingua Libre. Huuu, this is the repository of an old version of Lingua Libre, deprecated since one year. With the project grant linked in the description we moved to the current version, which is a complete rewrite of the old one (and not directly related to WMFr anymore). That's it. Wikimedians are more used nowadays to report bugs / ask features on phabricator (and they don't need to create a new account), and the board feature here better fits our needs. 0x010C created T195565: Create a new phabricator project for Lingua Libre. Liuxinyu970226 awarded T169741: Show both "edit" and "edit source" tabs/section edit links on the French Wiktionary a The World Burns token. 0x010C added a comment to T169741: Show both "edit" and "edit source" tabs/section edit links on the French Wiktionary. Since everybody seems to agree that the wikitext editor should be the default editor, I've changed the configuration in this way, "not as a perfect solution, but as a way of somewhat improving the situation as soon as possible" as @Whatamidoing-WMF said. 0x010C awarded T100070: Allow CheckUsers to set User agent (UA)-based IP Blocks a Like token. 0x010C created T186739: Allow oauthclient-php to forge requests containing files. 0x010C added a comment to T110460: Update OAuthAuthentication to use AuthManager. @Tgr I would be interested in using this extension on a Mediawiki 1.30, do you plan to finish this task? 0x010C updated the task description for T184848: OOjs-ui's select input overlap vector's top tabs. 0x010C created T184848: OOjs-ui's select input overlap vector's top tabs. 0x010C closed T177823: Timeless and Kartographer interactions as Invalid. @RolandUnger Oh, yes, didn't find it before creating this ticket, I close it. 0x010C added a comment to T180361: Allow a wiki to natively show separators between references. However, for this to work correctly, you would have to remove the reference class from Modèle:,. Otherwise, it would add commas after the commas that have been added manually. Also, the styles in https://fr.wikipedia.org/wiki/MediaWiki:Common.css that target .reference and .exposant would have to be changed to include .cite_virgule so that the commas are on the same height as the references. Once this is done, it will work. 0x010C added a comment to T160767: Inconsistent coordinates with different page widths. There is a massive misunderstanding arround thoose coordinates, there are many people which does not understand what they represent. Imho, the best solution would be to simply remove them, and enable instead the right-click popup everywhere (cf T178338). 0x010C added a comment to T178338: Maps: right click on map to determine latitude / longitude. This feature is in the ext.kartographer.preview module, which is load only during page preview. I'm also in favour of activating this feature all the time. 0x010C claimed T180099: Map scale hidden on the left because of overflow.